Services Offered at Caponio Chiropractic Inc.
We aim to have affordable rates allowing access to high-quality care for you and your family. Your Chiropractor's goal is to adjust your spine back to its normal misalignment-free state. specially trained to use palpation to feel for muscle spasm, tenderness, and tightness in the muscles along the spine. These assessments allow the Doctor to determine the location of the spinal fixations that are in need of adjustment. The re-exam allows the doctor to assess the progress of any current conditions. It may include a revisit of the History, a Posture Assessment, Range of Motion Assessments, and Ortho-neuro assessments. The Chiropractor uses palpation to feel along the spine for muscle spasm, tenderness, and tightness. The assessment findings allow the Doctor to determine the progress of the patient's condition(s). Adjustments are offered to promote relief from pain and pressure that can occur from daily use and posture positions. The Chiropractor utilizes a variety of methods to adjust the spine, and incorporates several peices of adjusting equipment to assist with correcting spinal fixations, including a Gonstead chair and a knee-chest table. Your Chiropractor and thousands of other doctors around the world now use the hand-held Impulse Adjusting Instrument® in the care of their patients, when indicated. This patented and FDA registered device was specifically created to deliver gentle and precise chiropractic adjustments to the joints of the spine and extremities to relieve pain and restore function. The Impulse Adjusting Instrument® is controlled by micro-computer circuitry housed within the device that produces a controlled force that chiropractors can use to treat different areas of the body. The Activator Method Instrument is a hand-held instrument that the Chirorpactor may use to deliver a mild adjustment to the fixated joints of the spine, and is gentle enough to be used on pediatric as well as senior citizen patients. The Vertebral Distraction Pump is a hand held instrument that the Chiropractor may use to adjust the spine. Often gravity and posture positions can compress our spine, but the VDP-Pro instrument gently applies pressure to relieve this compression. Studies show it may help treat and reduce disc herniations, help with sciatica, and be a viable means of applying myofascial release of musculoskeletal conditions. To learn more about the VDP-Pro case studies please visit this link: http://www.vdp-pro.com/studies/ and to see if this method may be beneficial for you, consult with Dr. Caponio, DC. Chiropractors inspect the spine to look for potential issues with subluxation, fixation, and joint irregularity but these subluxations, fixations and joint irregularities can also be present in the extremities. Chiropractors adjust extremities, meaning the numerous joints present in the body, including the jaw, shoulder, ribs, wrist, elbows, fingers, hand, hip, ankle, knee, and the feet. The extremity adjustments complement the spinal adjustment. I. Adhesion Breaking With Instrument Assisted Soft Tissue Mobilization Instruments- For adhesion breaking muscle work, the Chiropractor utilizes Instrument Assisted Soft Tissue Mobilization Instruments (IASTM) which are specifically designed to help correct the adhesions and scar tissue that form due to injury and inflammation which occurs during injuries, surgeries, overuse, and underuse conditions This type of manual therapy aims to increase tissue elasticity and fibroblastic activity to return the muscles and surrounding tissues to as close to pre-injury status as possible. This is accomplished by initiating a controlled inflammatory process and commonly a petechiae rash results in the area that was worked on. This process allows the tissue to begin the healing process, breaking down scar tissue and adhesions in the tissue and redirecting collagen formation in the proper orientation for correct movement of muscles and tissues. Adhesion Breaking work is a more intense type of manual therapy, and is therefore done in short amouts of times, from a few minutes to not to exceed a total of a 8-15 minute total process. Adhesion breaking work can be done on one or more areas of need. To learn more about this process visit: http://www.adhesionbreakers.com. II. Adhesion Breaking with Hands-on Muscle Release Technique - Muscle Release technique is a manual therapy that aims to treat soft tissue injury and adhesions. Muscles may build up scar tissue and adhesions which can lead to weak, short, and rigid muscles. Adhesions alter the motion of muscles and joints, and can cause symptoms like pain, numbness, weakness, tingling sensations, and reduced range of motion. The Chiropractor assesses the texture, tightness and mobility of the muscle while using hand pressue aimed at breaking up any scar tissue/adhesions. The Chiropractor also guides the patient to actively move or stretch the affected area during the treatment. Depending on the area addressed, this therapy may may reduce symptoms such as muscle pain, back pain, tennis elbow, carpal tunnel syndrome, and sciatica, to name a few. The Chiropractor offers muscle work and gentle manual or instrument adjusting of the jaw designed to help alleviate the symptoms of Temporomandibular Joint Disorder (TMJ). 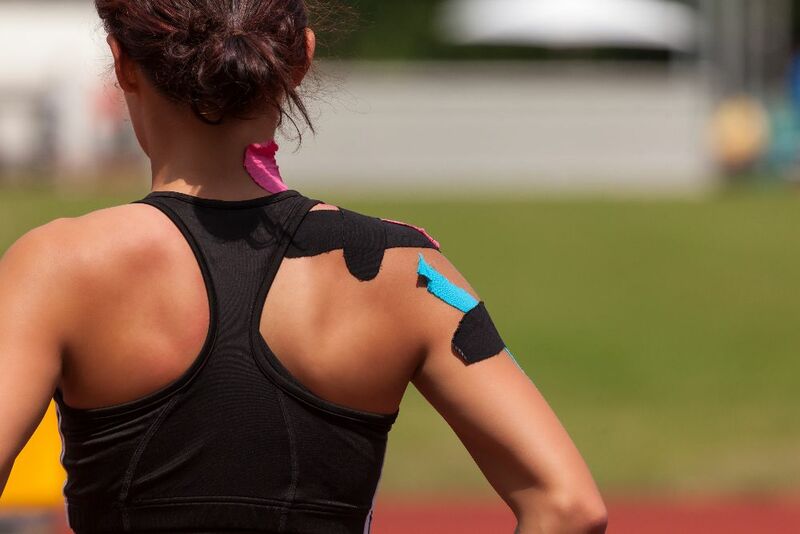 Kenesio taping is a rehabilitative taping technique that is designed to facilitate the body’s natural healing process while providing support and stability to muscles and joints without restricting the body’s range of motion. The doctor has a wealth of ideas and tools to teach patients about the use of therapeutic exercises to promote strength, range of motion, and flexibility. The Doctor can assist with demonstration and supervision of recommended therapeutic exercises. *Future prices subject to change. The images provided are stock images/models.